Founded in 1836, this graceful city lies nestled on the coastal plain between Gulf St. Vincent and the Adelaide Hills. Adelaide was the vision of Colonel William Light, Australia's Surveyor General, who created a one-mile-square grid for the city's center and surrounded it with a belt of stunning parkland. Today, Adelaide is a metropolis of over one million people, boasting wide, tree-lined boulevards, superb Victorian and Edwardian architecture, tranquil parks, world-class shopping, and the highest number of restaurants per capita of any city in Australia. Beyond the city and the rugged Adelaide Hills lie the Barossa and Eden Valleys. Here Australian vintners are winning international acclaim for their Cabernet Sauvignon, Riesling, Sauvignon Blanc and Shiraz. One of the world’s great cities and harbours, Sydney always lives up to great expectations. When you are on one of our Sydney cruises, the first glimpse of the Harbour Bridge and Opera House will stay in your memory forever. Even before the 2000 Olympics, cruises to Sydney had much to offer – hosting the games just made the city even better with improved facilities and extra dining and entertainment venues all round. From the waterside restaurants fringing the historic Rocks district, the Sydney cruise tour takes you around Sydney Cove past the Circular Quay ferry terminal to that remarkable Opera House and the beautiful Royal Botanic Gardens. 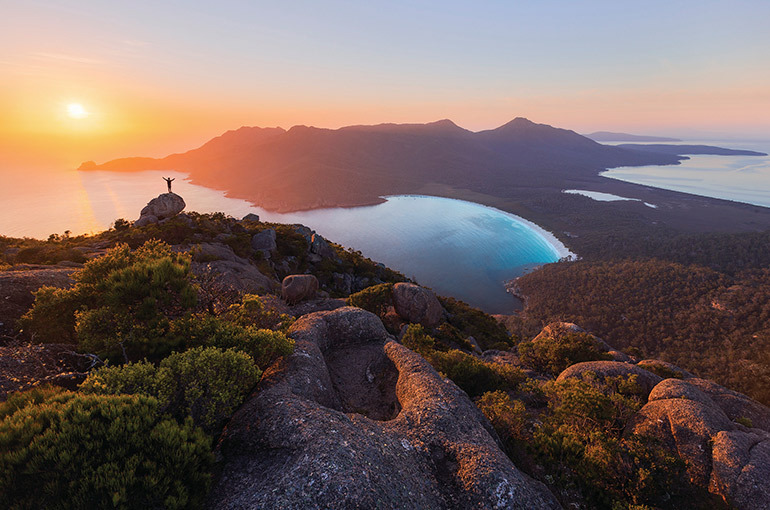 Cruises to cosmopolitan Melbourne, which is Australia’s second largest city, bring into your holiday a combination of distinctly European feel with the home country’s celebration of the outdoor life. Set on the Yarra River and close to national parks and beaches, the city certainly loves its sport from Australian Rules Football and cricket to horse racing and grand prix motor-racing. While, for culture-vultures, Melbourne cruise must-visits include the Victorian Arts Centre with its magnificent concert and theatre complex allied to the National Gallery housing Australia’s greatest collection of fine art; and the Melbourne Museum, the largest in the country with fascinating displays of Aboriginal artefacts. One of the best ways to get an immediate feel for the city is to jump on a vintage tram which will rattle you around the key sights in the city centre. Cruises to Melbourne also benefit from the town’s hugely diverse cultural mix which makes for an incredible variety of cuisine, from Greek and Spanish to Chinese and Vietnamese. Many also operate a BYO (Bring Your Own) policy, allowing diners to buy their favourite tipple cheaply elsewhere and then take it in to drink with their restaurant meal. 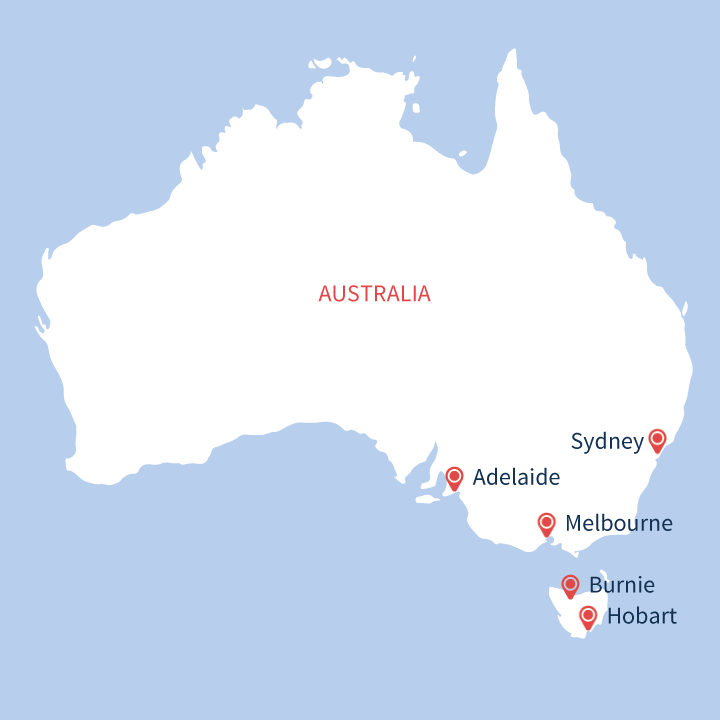 The city of Burnie overlooks Emu Bay, on the north-west coast of Tasmania. The emus that gave the town its original name have long gone and now Burnie’s emblem is the rhododendron after the 9,000 flowering bushes that thrive in the Emu Valley Rhododendron Gardens. 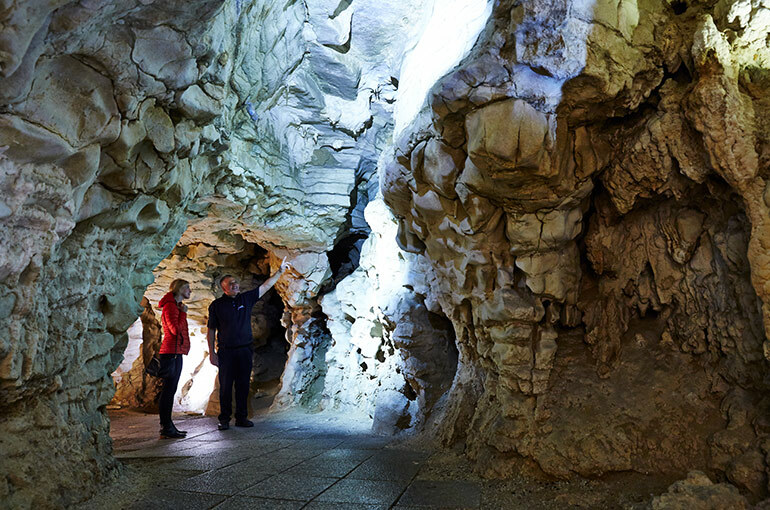 From Burnie, your cruise tour leads you to Tasmania’s second city, Launceston, where Australia’s largest collections of Victorian and Edwardian buildings stand proud. With so much that Burnie cruises have to offer, spend your time exploring the scenic Cataract Gorge Reserve, just 15 minutes walk from the city centre, or sampling some of the Tamar Valleys fine wine. At the Queen Victoria Museum, enjoy an extensive collection of pieces from Australian colonial art, contemporary craft and design and Tasmanian history. Hobart is a compact city, oozing with both modern and historic charm. Wander through colonial architecture and take in the vibrant energy of the creatives who choose to live here. Find pristine nature and artisanal produce, daring modern art and hip bars and restaurants. Hobart is a very special place. Tap into its eclectic magic. The Bay of Islands offers more than broad vistas of sea and sky, more than beaches, boating, and fabulous water sports. The Bay is the birthplace of modern New Zealand. Here the Treaty of Waitangi was signed, establishing British rule and granting the native inhabitants equal status. Rich in legend and mystery, the Bay of Islands has age-old ties to the Maori and to whalers, missionaries and New Zealand's early settlers. The Bay of Islands has lured explorers for countless centuries. The Maori say that Kupe, the great Polynesian adventurer, came here in the 10th century. Captain Cook anchored offshore in 1769, followed by assorted brigands, traders, colonists and missionaries. New Zealand’s biggest city and major cruise port, Auckland, sits between the Pacific Ocean and Tasman Sea, which is how it came to host the America’s Cup twice - in 1999 and 2002 - attracting investment to transform the harbour side into a superb meeting and eating place which all Auckland cruise visitors can now appreciate. The Viaduct Harbour area now boasts outdoor restaurants ideally placed to view the hundreds of yachts attracted to this icon of sailing success. This ‘City of Sails’ is also home to New Zealand’s impressive National Maritime Museum which charts the nation’s seafaring history. Harbour ferries offer a great way of viewing the city, either by crossing the bay to old-established Devonport or under the harbour bridge to the suburb of Birkenhead. Otherwise cruises to Auckland take in all the sights from the revolving restaurant at the top of the Sky Tower, the tallest structure in the southern hemisphere at 328 metres. On Auckland cruises, shore excursions can take you to the remarkable geysers and mud pools of Rotorua. Tauranga is a Maori name, translated as resting place for canoes. Situated on a narrow peninsula and surrounded by water, Tauranga cruise destination lies within the Bay of Plenty, an area with beautiful natural harbours and endless beaches. Highlights of Tauranga cruises include a real ‘back to nature’ tour of Oraka Wapiti Deer Park, Waikato Stud and Longlands Farm. Bars and restaurants are dotted along The Strand, an area ideal for strolling around. At Rotorua listen to the pulsating rhythms of a traditional Maori Haka and see the seething, bubbling cauldron of geysers and mud pits. New Zealand’s capital and cruise port Wellington, is blessed with a wonderful setting, overlooking a glittering harbour filled with bobbing sailing boats. Behind the gleaming modern skyscrapers of its centre, you will find the city’s history well preserved in some outstanding old buildings. Embark on one of our cruises to Wellington and visit the second-largest wooden building in the world, the old Government Building – which was built in 1876. To see New Zealand’s story brought most vividly to life, your Wellington cruise tours include a visit the Te Papa Museum, a multi-level extravaganza of hands-on learning where you can explore a Maori meeting house, take a virtual reality bungee jump or even experience an earthquake. When Wellington cruises have so much to offer, make time, too, to enjoy lunch with a view on the city’s lively waterfront, then take a four minute ride in the Kelburn cable car to see the marvellous views from the top of Mount Victoria. Located at the head of Queen Charlotte Sound, Picton is your gateway to the South Island's famed Marlborough District. Once known primarily for its lush farm lands and many sheep stations, Marlborough came to international attention thanks to a new agricultural product - wine. The release of the 1985 Cloudy Bay Sauvignon Blanc put New Zealand on the map and changed the world's focus on winemaking in the Southern Hemisphere. Today, the Marlborough region boasts dramatic sea and landscapes, fascinating wine country, excellent restaurants and a number of the nation's finest gardens. Military names abound in this corner of New Zealand - the region is named for the first Duke of Marlborough, while the largest town, Blenheim, is named after his most famous battle. Picton is named for Sir Thomas Picton, a favorite of another general, the first duke of Wellington. Akaroa, meaning “long harbour” in Maori, certainly lives up to its name. Set on a beautiful, sheltered harbour, Akaroa is now a popular resort. Seek out the best spots for dolphin watching with tours from the harbour or relax on land at one of the welcoming bars or restaurants. Alternatively take a tour to Christchurch. Dunedin cruise destination is the home to New Zeland’s only true castle – Larnach Castle. Argued to be one of the best preserved Victorian and Edwardian cities in the Southern Hemisphere, the impressive Dunedin Railway Station is a fine example of the ornate architecture found throughout the city. This ‘Edinburgh of the South’ is well deserving of its title. Cruises to Dunedin will take you through a fascinating journey of history where you can discover the town’s Scottish roots and enjoy a taste of Scotland in the local style. As you wander through this warm-hearted and captivating city, there are Scottish influences throughout, including a statue of the famous poet Robert Burns, the woodland gardens of Glenfalloch and Dunedin’s First Church. 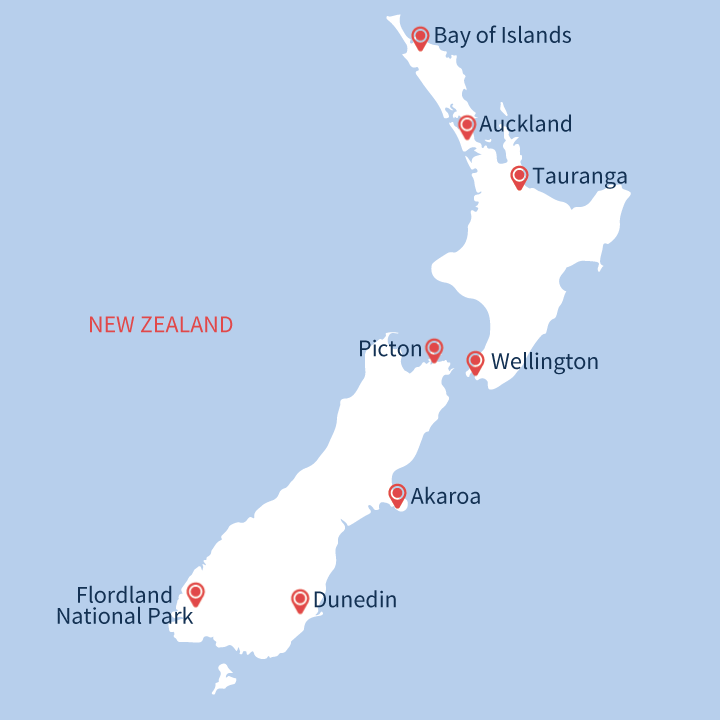 New Zealand's largest national park was formed millennia ago by massive glacial flows that carved deep fiords into the coast of New Zealand's South Island. At the heart of Fiordland National Park lies Milford Sound. Lined by cliffs that soar nearly a mile above its surface, Milford Sound cuts into the heart of the Southern Alps. Rainforest clings to the cliffs and graceful waterfalls plummet into the void. Mile-high Mitre Peak dominates the upper reaches of the sound. The town of Te Anau in Fiordland National Park is also your gateway to the South Island's other natural wonders including Lake Wakatipu, the resort of Queenstown and Mt. Cook National Park. The largest of the Loyalty Islands, Lifou lies some 118 miles to the northwest of New Caledonia. The island is an ancient makatea - a fossilized coral atoll raised high above sea level. Whalers were the first Westerners to visit this Melanesian paradise - though greedy traders lured by the island's aromatic sandalwood trees soon followed. Today's visitors are drawn attracted to the island's spectacular scenery, which ranges from dense tropical forest to dramatic cliffs towering above the crashing waves. Lifou's white-sand beaches are some of the finest to be found in the entire Pacific. Lifou and the other Loyalty Islands are part of New Caledonia, which, like Tahiti, is an overseas province of France. The island is a center of traditional Melanesian culture. The capital of New Caledonia, Noumea is a little piece of France in the middle of the Pacific Ocean. Before World War II, New Caledonia was a little known and seldom-visited French possession known for its penal colony and its natural resources. (Nickel smelting still plays a major role in the island economy.) Today, travelers are drawn to New Caledonia for its scenic beauty. The island is famed for its white-sand beaches while its west coast is the site of the world's second longest barrier reef. The offshore waters also offer superb diving and snorkeling. In 1774, James Cook thought the island's rugged hills resembled those of his native Scotland. Hence he christened the island New Caledonia. The island and its outlying groups became a French colony in 1854 and an overseas department of France in 1956. Vila is the capital of Vanuatu, an archipelago of some 83 islands in the Coral Sea. Vanuatu is a new republic, having achieved independence from France and Britain in 1988. Before then the archipelago was better known as the New Hebrides, the name given the islands by Captain Cook. Cloaked in dense rainforest, these volcanic islands were little known until World War II, when the islands of Espiritu Santo and Efate served as Allied bases. Today increasing numbers of travelers visit Vila, drawn by its easy-going charm, superb white-sand beaches and pristine rainforest. The islands are also renowned for their excellent dive sites and for their big game fishing. Vanuatu's visibility on the American scene increased when the CBS television series "Survivor" filmed in the archipelago. Vanuatu is also noted among anthropologist - its island of Tanna is home to the unique "John Frum" cargo cult. Located on the southern most point of the Vanuatu archipelago, this little jewel of the South Pacific is completely uninhabited. Formerly used as an allied forces landing strip during WWII, today only palm trees and sweet seclusion grow from the white sand of Mystery Island. The locals live across the waters on Tanna and visit the island during the day to spread their warmth, culture and wares. It's the perfect spot for couples, beach lovers or anyone looking to lounge in an ocean of beauty and literally get away from it all. Less than two miles in length from north to south, Dravuni Island lies in the Kadavu Island group of Fiji. Its volcanic peaks give way to a remote village of just 200 or so friendly villagers who live amongst the island's shady palms. These welcoming locals and their children often sing to arriving visitors. Well-worn trails scattered with coconuts snake around the unspoiled beaches, the soft sands beckoning underwater adventurers towards the crystal-clear waters. 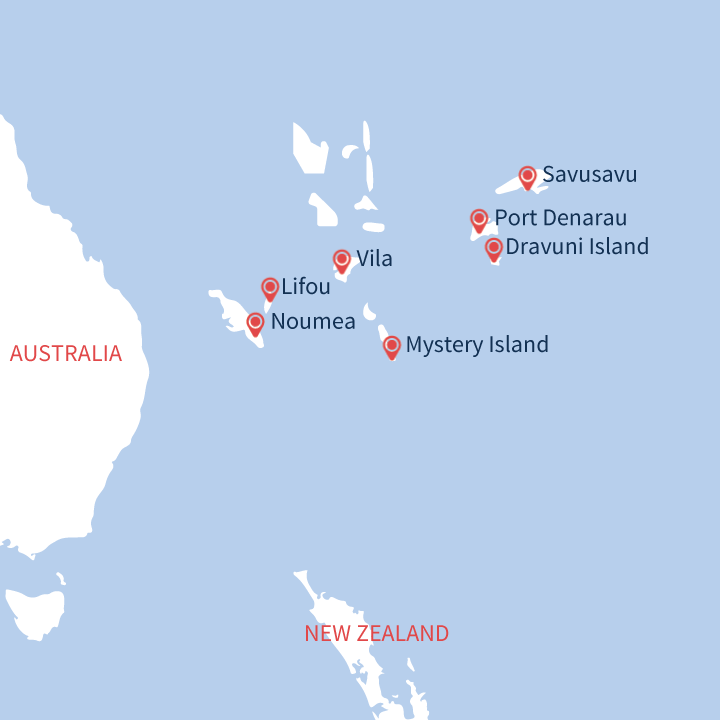 Many visitors come to snorkel in the Great Astrolabe Reef, or to hike Dravuni Island's highest peak for magnificent once-in-a-lifetime views of the surrounding islands. Therapeutic Port Denarau is not just the gateway to Mamanuca and Yasawa archipelagos; it is also one of our most popular destinations in Fiji. Its popularity has everything to do with the excellent sources of rejuvenation available. Unwind with a treatment in natural thermal mud pools or let the heavenly hands of a local masseur work their magic! Savusavu is also the sole port of entry on Vanua Levu for yachts, and one of the most popular places in Fiji for visiting yachties to put down anchor. There are two excellent marinas here and Savusavu Bay fills up with vessels during the high season. A new marina complex is planned on the waterfront east of town. If it’s ever completed, it will include an international marina, luxury villas and apartments, bars and cafes.